Last week, U.S. News came out with a report on the “best and worst” diets to follow for 2018. 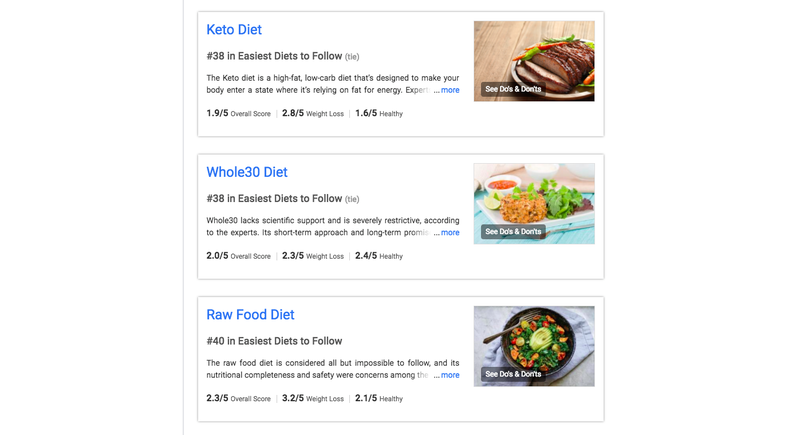 I won’t spend too much time on the problems with their rankings, but one aspect that stood out was that the Keto Diet tied for the second-hardest diet to follow out of the 40 they considered. I’ve been on a keto diet for about six weeks now, and this challenge is the one I hear about the most. Many curious people are turned off from trying the ketogenic diet because it sounds extremely difficult: counting calories, only eating certain foods, not eating lots of other foods, not knowing what to eat out at a restaurant, having to cook more… scary! In case you don’t already know how it works, a ketogenic (keto) diet is where you get most of your calories from fat, a moderate amount from protein, and very few from carbs. This is MUCH more fat than most people are used to eating. A standard American diet, for comparison, looks more like 50% carbohydrate, 15% protein, and 35% fat. And this is where the ketogenic diet gets intimidating. You see how much fat you have to eat (and how few carbs you get to eat) and worry about what you’ll eat at your meals and avoid trying it. Or, you try it for a few days with all of the calorie counting, then give up because it takes way too much mental energy. But it doesn’t have to be difficult or scary. After doing it for six weeks now and tracking almost everything I’ve eaten, as well as my ketone levels, I’ve come up with a few simple rules that have worked for adhering to a ketogenic diet without the headache. This one is pretty self explanatory. You can’t have any foods that would be considered carbs, except vegetables and avocados. You do get that ~25g per day allowance, but that will get used up by the one or two grams of carbohydrates in everything else you eat during the day. If you have something that is a carbohydrate on top of everything else you eat, that will put you over your allowance and you might not get into ketosis. Where most people fail at keto is they go through their day trying to follow the diet, then reach the evening, and realize they didn’t have enough fat and have to drink heavy cream to make up for it. Yuck. What you should do instead is front load as much of your fat as possible during “breakfast.” For me, that means having four cups of a keto coffee as I work in the morning. That’s usually black tea or coffee with 1 tbsp of butter, ghee, or MCT oil in it. If you want to mix it up a bit, I also like to have mushroom coffee with any of those fats in it, and you can also try MCT oil powder if the normal oil gives you disaster pants. But if you like eating a normal breakfast, then it’s still fairly simple: bacons, eggs, avocado, and then one or two keto coffees. If you have 3 eggs, that’s 15g of fat. 4 slices of bacon is about another 15g. Half an avocado is another 15. Each cup of keto coffee is 14g. Your goal is to get at least one third of your fat for the day first thing in the morning so you don’t have to worry about it as much later. To figure out that number, you can calculate your TDEE and then figure out what 70% of that is in grams of fat… or you can just go off of a simple rule: your goal weight is how many grams of fat you should have. If you weigh 160lbs and are trying to get down to 150lbs, then you should have 150g of fat throughout the day, and for breakfast you should shoot for at least 50g. If you weigh 110 and are trying to get to 100, then you should have 100g of fat throughout the day, and for breakfast shoot for at least 33. 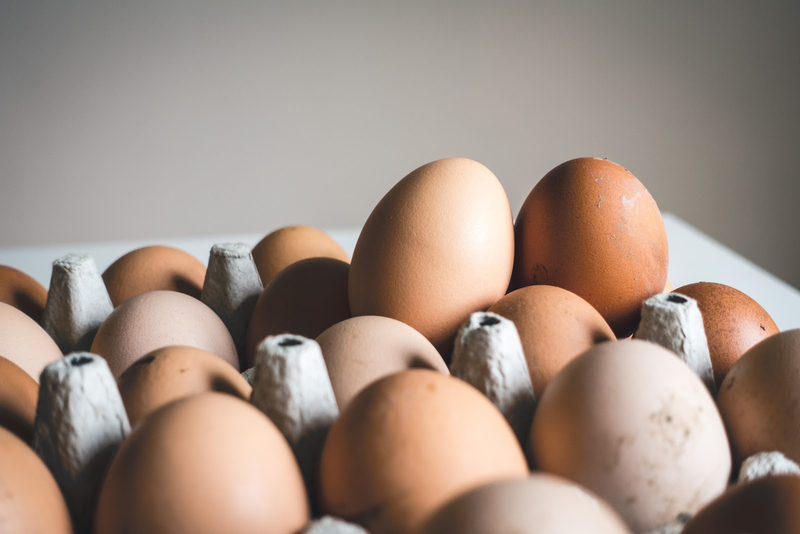 Since most of the breakfast foods we’ve looked at are in the 15g of fat range, we can make the rule simpler: divide your goal weight by 30, round up, and thats how many “fat servings” you should have for breakfast. This seems like a lot of thinking right now, but once you figure out what your number is and find a breakfast mix that you like you never have to think about it again. I look forward to the smooth, buttery coffee now, and you’ll probably find you enjoy the taste too. Make a fist. That’s how much fatty meat you get, twice a day. For me that comes out to about 1lb or 16oz of steak total, which has exactly the amount of protein I need to hit my ratios. If you’re smaller, it will likely be more like 12oz, which should be around the amount you need. If you’re bigger, you might get more like 20 or 24oz. This rule isn’t perfect, but it’s a simple starting point. Instead of constantly trying to figure out how much protein you’re getting, hold your fist up to it, and remember that you get two fists of fatty meat per day. You’ll get most of your fat from your fatty breakfast and your fatty meats, but you still need to add a bit more into each meal to make sure you hit your goal. The easiest way to do this is to add cheese, salad dressing, or nuts. If you can get a handful of cheese, handful of walnuts or pecans, or add 1-2 tbsp of olive oil, caesar, or ranch dressing to your salad, you’ll get the fat you need. If you can follow those four rules, you should get into ketosis and start losing fat. But to make sure that you’re doing it successfully, it helps to do some degree of tracking. The easiest way is to track your weight. If your weight is going down, you’re probably doing it right. The next easiest way is to get some ketone pee strips. These will change colors based on the level of ketosis you’re in. They’re not perfect, but they’ll give you a rough idea of whether or not you’re getting into keto. The third and best method is to get a blood ketone testing device like I use. This lets you see very clearly whether or not you’re in ketosis, so you know how well you’re sticking to the diet. Make sure you’re really eating no carbs. No sweeteners, no carby dressings or spreads, no high-carb nuts. Reduce your meat intake. You might be having too much meat, so cut it back to one and a half fists. Reduce your total intake. You don’t want to reduce the ratio of fat, so the last thing to try (primarily if you’re not losing weight) is to simply eat less of everything. Follow these five rules, and you should have no problem getting into and staying into ketosis. The first week might be a little rough, but after that you’ll find it’s a surprisingly easy diet to live on. I Consumed Nothing but Water for 5 Days. Here's Why, What Happened, and Why it Was Awesome.